Isil Erel, David A. Rismiller Chair in Finance and the academic director of the Risk Institute at the OSU Fisher College of Business, holds a PhD in financial economics from MIT Sloan School of Management. Her research spans a variety of areas within corporate finance, with particular emphasis on mergers and acquisitions, corporate governance, and banking. This research has been published in top finance journals such as the Journal of Finance, Journal of Financial Economics, and Review of Financial Studies. Professor Erel is an Editor of the Review of Corporate Financial Studies and an Associate Editor of the Review of Financial Studies. She also served as an Associate Editor of the Journal of Banking and Finance and Financial Management. 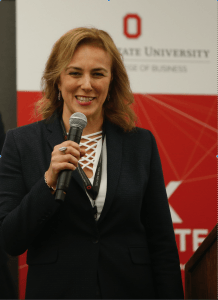 She is the 2010 recipient of the Pace Setters Faculty Research Award and the 2015 recipient of the Distinguished Faculty Award at the Fisher College of Business. She also received the Distinguished Referee Award from the Review of Financial Studies in 2012. She serves as a Board member of the Foundation for the Advancement of Research in Financial Economics. Professor Erel teaches Financial Institutions in both graduate and undergraduate programs at Fisher.